Barely two months after it unveiled its 2014 flagship, the Xperia Z2, Sony is making a variant of its current flagship available in the US. This Xperia Z1 is the same as the existing LTE version of Xperia Z1 in all aspects except one: it can be used on any network you chose. This isn't the first unlocked version of the Xperia Z1. One variant went on sale late last year, but that was for the non-LTE version of the device. Then the LTE-capable Xperia Z1S landed on T-Mobile exclusively. Now the LTE version is getting the same treatment so those still wanting to buy the device without being tied to a particular carrier can pick one up now. Otherwise this variant has all the same features, and maybe even quirks, of the Xperia Z1 that was unveiled last year. Including the 5-inch 1080p TRILUMINOS display, the 2.2 GHz quad-core Snapdragon 800 processor, the 2 GB of RAM, the 20.7 megapixel rear camera, and the IP55 and IP58 dust- and water-proof rating. You can also catch our hands-on experience of the Xperia Z1 as well as the Xperia Z1S to see those features in more detail. 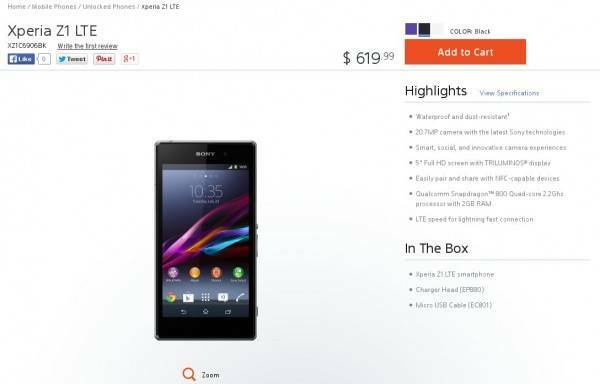 Being a device with no contract, the price point for the unlocked Xperia Z1 will definitely be high. Sony's asking price is $619. Although all three color options are available, only the black one is currently on stock, with the purple and white estimated to ship only by the end of the month.